When choosing the right floor for your home, it’s important to consider how different floors are constructed. The material, style and cut all affect the look of the finished product. There are many different species, types, and styles of flooring available. Let's learn more! Choosing the right species of wood flooring is a matter of your style, budget, and personal preference. More than 50 domestic and imported species of wood flooring are available to achieve a unique look. As a general rule, light woods make a room appear more open and airy, medium woods make a room feel warm and cozy, and dark woods make a room feel stately and refined. Wood floors come in a variety of species, offering numerous looks and color options. Wood, like all organic materials, is very dynamic. No two species will be alike, and there can even be a lot of variety in appearance from the same tree. In fact, there are many different factors that will affect the way the finished floor will look. These can include things like where the tree is grown, where the wood comes from the tree, how the wood is cut, and the finish that is applied to the floor. Wood floors are manufactured in almost any width. Some of the most popular styles are strip, plank, and parquet. Each style is available in a variety of species, colors, and widths, so choosing the right one is a matter of preference. Strip flooring is less than 3” wide and often makes a room appear larger. 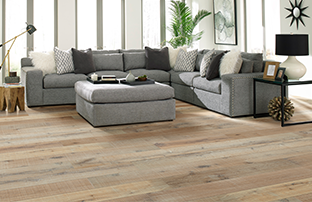 Plank flooring is equal to or greater than 3” wide and often creates a more casual look. Parquet flooring varies in size and generates a geometric, non-linear look. Wood flooring is made from hardwoods, softwoods, domestic lumber, and a variety of imported lumber. Each wood species has unique visual characteristics and maintenance needs. Visit our species gallery to learn more. Many factors impact the appearance of wood flooring, including its grade and saw cut. Wood grades are determined based on the physical characteristics of the wood. All grades are equally strong and serviceable, but each looks different. 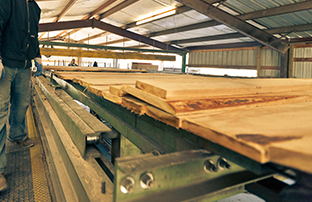 Additionally, the angle at which a board is cut determines how the finished product looks and performs as well.